It’s been felt less like a holiday and a bit too much like work, but we’ve used our second week off well, and Kate has finished the first edit of Parsantium: City at the Crossroads, and I’ve finished my revisions to that edit. This is great news as it means we can start laying out the book next weekend, prior to the second (hopefully much quicker) second edit and subsequent proofreading. Nearly all the interior art is in too which is excellent. My Parsantium D&D campaign restarted again last night after a short hiatus. If you were wondering about the kind of adventures PCs can get up to in the city, you can read a write up of the game here. 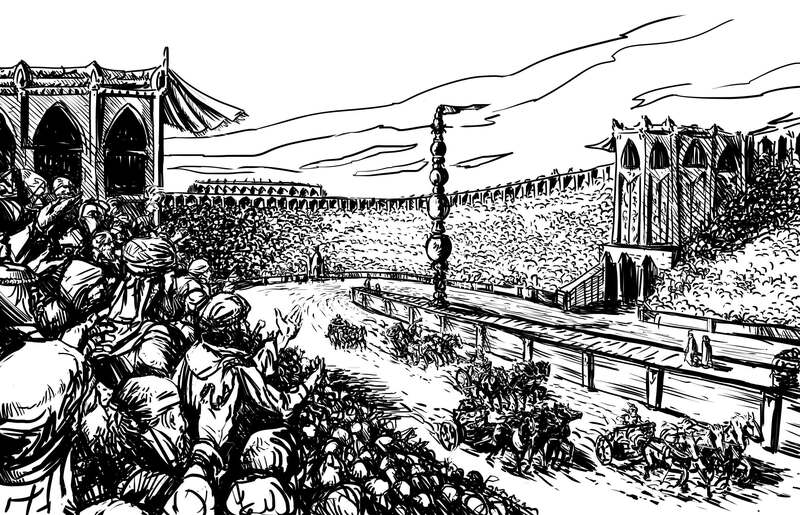 As this session featured a chariot race at the Hippodrome, I thought I'd post Matt Morrow's superb finished illustration.